I hope you're all having a wonderful holiday season. It's so hard to believe that Christmas is done and dusted, and that I'm two hours away from the last day of the year. What a lot of preparation and shopping we did, and the big day passed by in a flash! I'm not good at taking photos when I'm uber busy, but here are the few that I (+ Marty & Amy) took. Marty cleverly took a picture of the table all set for Christmas lunch. I completely forgot with all the running around, cooking and last minute preparation. He takes much better pictures than I do anyway :-) One of these days I'll have enough of the Masons Vista dinner set that we can all have matching plates, but for now I'll mix and match with my white pieces. And a fun thing that I do each year is have a decoration on everyone's plate that they can take home at the end of the day. Another thing you can see on the table is Camo's gingerbread house. I purchased two from Ikea recently so that he can work on his own while I make up mine. So much fun. We'll make the other one up later on in the holidays. Here's a picture Amy took on Christmas day. Once all our family had arrived, the tree was absolutely bursting from below with presents. We had a great time opening them all, and the lounge was completely trashed afterward. I STILL haven't put the room entirely back together again. You just can't rush these things, right? Next, it was time to make jam again. Our apricot tree has borne so much fruit this year, and I've no idea what I'll do with it all. Fortunately it had the good grace to ripen the day after Christmas, rather than the day before like last year. Christmas Eve is not the ideal time to rush into jam production. I have made so much jam, and I've stewed and frozen some too. I've been giving the fruit to neighbours and friends, we're so blessed to have such a productive tree with such sweet fruit. And in a month or so our peach tree will be ripening. I really love our summer fruits. Today I have finally gotten a little of my sewing mojo back again. I lost it for a little while there. I've finished cutting out the next row of my Mrs Billings project, and I'm almost done marking the sewing dots on the reverse side. This one is a tricky one with lots of inset seams, so I have to be super careful. I'll share a picture of where I'm up to asap! Chatter soon! Here is my Gingerbread House for Christmas this year. It's one of my favourite things to do for the holiday season. Each year I try something different - I can't imagine I'll ever get tired of it! This year I made windows from crushed boiled lollies. After the walls are par-baked, you put the lollies in the holes and bake it again and they melt down. I'm thrilled with how they look, and the battery operated led's I found at Ikea are perfect to light up the inside. Wow! My dear friend Lizzy is amazing! I can honestly say I've never heard any urban legends recounting tales of quilts being turned around in 16 hours, but that is exactly how long it took for my quilt to be quilted and back in my hands! Amazing!! And believe it or not, I actually cropped the worst of the blurriness out! I've already applied the binding, and I'm around one quarter the way through the hand stitching on the reverse side - I used the same fabric that I used in the sashing strips for the binding and it looks really cute. As promised, here is the finished top, destined to be a special person's Christmas present. This top was inspired by a quilt I saw at work last month. I think it was originally a Sudoku quilt, but it works really well with two packs of charm squares and some yardage. I've used French General prints - Lumiere de Noel & French General Favourites. I don't recall what range the border print is from, but I jut love it. There is one individual on our Christmas list that I always struggle to find a great gift for. Today I had a bright idea. I'll make them a quilt! Nothing like leaving things to the last minute ... what was I thinking??!!?? Save me from myself!! PS: I'll share a picture when it's more 'together'. I don't think I've even turned my sewing machine on this past week. It has been a flurry of getting ready for a big party on the weekend. It was Amy's 18th! Where does time go?? And for a little fabric content, hot on the heels of me declaring that I'll never need to buy any more fabric, 9 yards arrived today. This is the backing for my Mrs Billings project. I have some of the same fabric in the red colourway on the front of the quilt. Hopefully this will be the perfect fabric. The kids and I are on holidays now, so hopefully I'll have lots of time on my hands and many interesting things to share. Chatter soon! $59.00 worth of Summer fun. Even if it only lasts a few weeks, it'll be worth it. I was cleaning out my fabric closet, and it has become clear to me. That I must NEVER buy fabric again. NEVER!! This week has been so much more pleasant and shiny than last week. First up, my DH has managed to get my laptop up and running again with a new hard drive, which is great news. But on that note, laptop - be warned. Any more shenanigans, and it's trash time. No doubt. I've installed most of my software again, and it seems I haven't lost anything, happy days. But the happiest of news is this: Yesterday morning I purchased a new sewing machine! Oh my goodness, I'm so excited. It's going to take me a while to get used to this monster (and I say monster because it's sooooo much bigger than my old Bernie). That tape across the front of my cabinet is 19 or 20 inches wide. After I've done on the computer, I'm going to have a play so we can get acquainted. Well, that's my news for now, I'll chatter soon! It's going to be tricky for me to catch up on blogs for a bit, and hard to do interesting posts. My darned laptop is on the fritz again. DH is determined to fix it - I'd rather get a new one - this is the third time and I do like my playthings reliable. I'm just freewheeling around here, but it's fun, and I quite like how it's coming up. Apparently someone thinks it's okay to sleep on the dining table. On my quilts! Why Gracie, why?? It's by Johnson Bros. and it's called the Friendly Village Lighted Church. I picked it up in April this year when Mum and I were in Melbourne. We visited Harbour Town and found a Royal Doulton DFO. I had seen this sweet little church in a department store before Christmas last year and really coveted it. But I hesitated at the around $100 price tag and sadly walked away. So, when I saw it at the DFO for $29.00 I was just thrilled and snapped it up. I know I'll be enjoying this little treasure for years to come. And in other news, this evening I'm pinning a quilt before I head to bed - there will be quilting aplenty on the agenda tomorrow. It has been such a busy week for me - kid stuff - family stuff - and trying to keep on top of the chores, which seem to be piling up at an alarming rate. I've been feeling like I'm only getting the 'have to do' stuff done, and not much of the 'fun to do' stuff. So yesterday I was determined to change that. I think I must have used larger patty pans than they did, because I didn't end up with the same numbers as their recipe, and I also had to bake a little longer. Despite that, they are still moist and super yummy. And the house smelled divine while they were baking. There is even real vanilla in the icing, though Camo thought I must have gotten dirt in it *lol* I'll definitely put these into the regular rotation. It's fun to practice my quilting on these small pieces. Hopefully I'll get more adventurous as I go along. 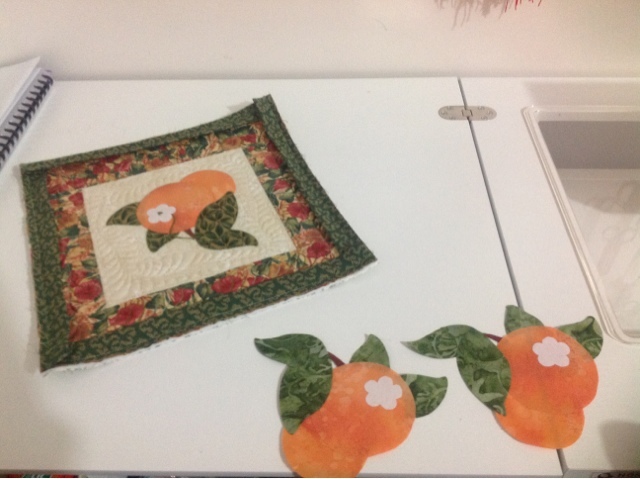 I'm finding that Pinterest is a wonderful reference to see how people are quilting their projects, and for picking up ideas for filler quilting. I'm having fun working on this quilted item. It has been really time consuming, and it just kills me that it's a secret squirrel project! No big deal to share just a little ... but it'll be six months before I can show you the whole thing! It can't come around soon enough! A big thank you for your lovely comments over the past week - I'm way behind with my emails and will catch up soon. On Thursday while I was working at the shop, one of Lyn's quilt group members Pauline, dropped in with the most delightful show and tell. She has been working on the Insanity quilt for two years now (along with a hand pieced Dear Jane) and has recently finished the top. If you haven't heard of the Insanity quilt, it was in the Australian Patchwork & Quilting magazine a few years ago. It's English paper pieced, and made with 1/2" hexagons. That's a serious commitment to hexagons! I just love love love it, but can't imagine it'll be something I will take on any time soon. I do have a few friends that have started however, and I know they're loving it. I was surprised to see upon closer inspection that Pauline hasn't used 30's prints in her quilt, as it has that look from a distance doesn't it? Is it just me, or did this week not seem to have as many days in it?? I'm sure I promised to share a couple of pictures earlier in the week, and here it is Friday evening? I must have blinked and missed it! This first pic shows what I picked up from Patchwork by Sea - the little brother and sister to the iPad cover I made up a little while back. There is a cute purse, and an iPhone cover. I can't wait to make them up. They're just adorable. And at Somerset Patchwork and Quilting's booth, I did a little shopping, even though there were SO MANY things to tempt me. I had to show restraint, as I know I have a fairly full year ahead of me in terms of projects. There are a couple of things I'm still kicking myself that I didn't purchase. I wish I'd gotten the little house block from the same range as the Lemoyne Star. I may still call and order it. Also, there were these cute little totes for only $5.00 that a few of my friends picked up. I have no idea why I forgot to go back and look at those. And last of all, I SHOULD have gone to check out Reece Scannell's booth - I'll have to try and visit with him next year in Melbourne. Quilt Show & A Little Giveaway! Today I had a lovely day at our Guild's quilt show again. It's always lovely to catch up with my buddies, pore over the beautiful quilts, and of course, partake in a little retail therapy. One of my dear friends that I caught up with today is Rachelle Denneny. She was the very deserving winner of the Best of Show award this year with her Golden Ivory quilt. My pictures do it no justice, but you can see that it is simply spectacular! I'm just thrilled for her. And now for the little give away that I briefly touched on earlier this week. I received these patterns with an order last month from Patchwork with Busyfingers. They are just delightful, but I know I'll never get around to making them, so I've decided to send them on to a new home. If you'd like them, just leave me a comment, and I'll draw a winner on Sunday evening next week. They're patterns for the English Paper Piecing technique, so if that's your thing, you'll love the patterns. Have at it friends! Today I visited with my quilt at the Guild show. I was just so thrilled to see her hanging with her ribbons - one for me, and one for Lizzy. I'm all tuckered out though, so I'm going to take a nap on the lounge ... I'll check back in soon! My goodness, it has been just over a week since I've posted. It's not for lack of anything newsworthy, I guess I've just been a little disinterested. My bad ... I promise I will do better later this week ... cuz I've had a little surprise. I got a call tonight to let me know that my quilt has won something in the guild show. How fun!!! I have no idea what it could be - I suspect it has placed in its category. So when I visit the show on Friday, I'll be sure to let you know. It has been stormy in Adelaide over the past 24 hours, and my clever husband managed to take a great picture of the lightning - there was so much lighning!! Isn't that something else? Just huge! Marty takes great pictures. Though a little loud and scary at the time, this was nothing at all like the terrible storms that have ravaged our friends on the east coast of the USA, my heart goes out to everyone suffering in Sandy's wake. I can't even imagine what you're all going through. This week I've been cutting and cutting for the next border of my Mrs Billings quilt. There are hundreds of pieces to cut. I need 200 of the diamonds in the background print and 200 in my coloured prints. I need 204 of the little triangles in the background print and 200 in the coloured prints. And then I need to put dots at the seam intersections on the back to make it easier to piece the borders together. Whew! I've just finished the background print cutting this afternoon, so I'll get busy on the other prints soon ... wow, this has been time consuming. And in other quilty news, I'm almost finished all the blanket stitching now too - just a few leaves to go. How fun to be getting on top of things. It's been a while since I shared any shoe purchases - and you all know I'm way into shoes, so here are some sweeties that I picked up on Thursday. The weather has warmed up here so I'd been thinking of picking up a cute sandal for Christmas, and these fitted the bill. Aren't they darling? I just love them. While I was putting them away I found a pair of ballet flats I'd picked up a couple of months ago and instantly forgot about. They're so cute in a gold and black tiger stripe. I'll have to break them out and start wearing them too. Something else that kept me busy this past week was the final bits and pieces for my Farmers Wife Sampler quilt. Won't be long now until our guild show - I dropped off my quilt on Friday, and believe me I was so relieved to have the hanging sleeve and label finished in time. I'll be sure to share a picture when it's hanging up. I just couldn't help myself. It seems I have impulse control issues. I just HAD to put the next border on my Mrs Billings quilt. Goodness me, this thing is growing! I said last time that there were only three borders to go, but I forgot about one of them, so there are NOW three borders to go. The next border will be time consuming - filled with Y seams. I'll have to take it slowly to make sure it comes out neatly - but first, I MUST finish all my blanket stitching ... (which can be mind numbing) but I can do it if I just apply myself, right?? Oops - the one above is quite blurry - that's what I get for using the iPhone in a hurry. You can see the quilting in the centre quite well can't you? Lizzy did a wonderful job, I'm just thrilled - thank you Lizzy! And in this one you can see a little teeny bit of the backing fabric. I chose a double wide by Judie Rothermel from the Mill Girls collection. It's really quite pretty. I was glad to have a little left over to put in my scrap boxes. The only things that remain for this quilt are to place a label on the back and give it a hanging sleeve. Those are things I traditionally do at the Very Last Minute. It would be smart to do it now, but they're my least favourite things to do *lol*. Given that I've been on a bit of a roll with Mrs Billings lately, and I had cut out the next lot of triangles, I decided it was high time I added the next border. It's tiny compared to the marathon that was the double diamond border, but I'm so glad it's in place. One thing that thrills me right now is that the top is still relatively flat. With a medallion quilt (and especially one with so many pieces) it can easily get very ripply with the addition of each border. So far so good, but maybe I shouldn't speak too soon ... there are still three borders to go. I'm off to do some MORE blanket stitching, so I'll check back in soon. 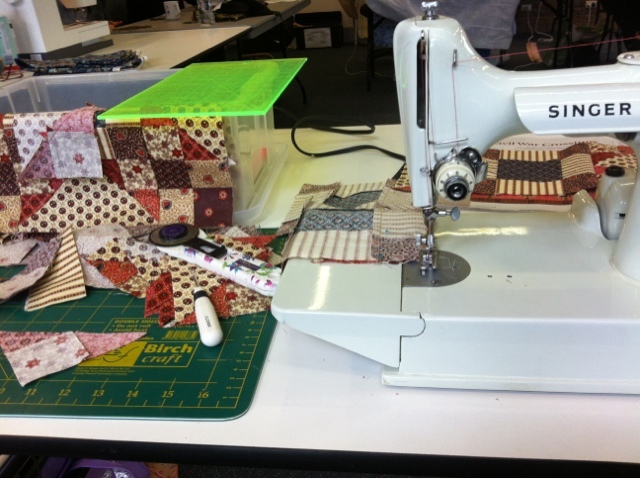 Yesterday was a fun stitching day with Claire, Shay, Loz, Lorraine and Kay. They're such a fun bunch of ladies and there is always a lot of chatter and laughter - thank you for hosting us Claire! I decided to take Mrs Billings along to work on - after seeing Victoria's progress on Thursday with her Mrs B's hexagons, I thought I'd like to get some done of my own. I didn't make up many, but I was motivated to work on it some more today, despite other projects that really need attention (shhh, don't tell the Quilt Police!). Anne of Green Gables was on TV today, so while I watched, I finished off the red hexie unit on the right, made up the hexie unit on the left. I also cut out a most of the hexagons at the top of the picture, and also the little triangles you see there. Believe it or not, there are over 100 of them! The hexagon units are for the final border of the quilt, and while I'm nowhere near ready to use them, I thought it was a great idea of Victoria's to piece them in stolen moments so they're all ready at the end. Well, that's been my day so far. I'm going to get busy using the little triangles to piece the next border - it'll be a lot of mindless chain piecing. And tomorrow I'm going to finish up fusing the applique blocks I shared a sneaky peek of. There are 8 of them - so I see a LOT of blanket stitch in my future. I'm going to be doing a pile of fusing and a bigger pile of blanket stitching tonight. This is a sneaky peek of a project I'll be teaching next year. As you can see, I'm just getting started! Last week on Wednesday I picked up my Farmers Wife quilt from Lizzy, she has done the most amazing job of quilting it. Shame my photography skills don't tally with her quilting skills. I've started working on the binding. You can just see it at the bottom of the next picture, and I've put a little piping in there too. The border has feathers, and the little red inner border has a really sweet little design with leaves - I just love it! In the picture above you can see the clamshell design which is featured in the main body of the quilt. I really would like to continue stitching the binding on the Farmers Wife quilt, but this morning I had my nails done and I don't want to mess them up with a thimble etc, so I busied myself with these blocks again. I had worked on them on Saturday - and prior to that, it had been more than a year since they'd seen the light of day. I've almost finished them now, so I could probably complete the top within the week if I put my mind to it :-) But of course there are always other projects to distract me ... so I won't make any promises! Today I'm spending the day with lots of lovely Guild ladies at a 'sit 'n sew'. We're having a lovely day, lots of laughter, chatter, stitching and feasting. I'm selling an item from my stash that I'll never get around to making: It's the Thimbleberries A Quilters Garden project from 2001 - all twelve block patterns plus two yards of the 'faux applique' block panels. And because I was going to make an extra pattern from the panels, I've included that pattern too. And once the dough had been in the fridge for a little while, he helped me roll it out. The most fun part is the decorating, but because he was really ready to get busy eating, we kept the icing simple. Last night I started cutting out some strips for a secret squirrel project. Would you agree that sometimes the hardest part is choosing the fabrics? These ones have been in my stash for a LONG time. I'm thinking maybe 12 years or so. I know that Linda gave them to me, and it could have been when I visited with her in 2000?!? I have been wanting to post this picture for about a week - but I had a slight technical issue ... the small people in our house had completely used up our internet allocation, and we were cut back to dial up speed for almost a week! Oh my goodness, I can't believe how much we rely on the internet now! I'm really glad to have the double diamond border in place, it seemed to take forever to piece. The next two will be much easier - the first of them being another border with the little coloured squares and background fabric triangles. I'll be spending quite a bit of time cutting first though. No other news to share right now - I'm working on a couple of 'secret squirrel' projects at the moment, which means I just can't share - even though I'd love to very much. Just three little wedge shapes need to be pieced, and I can attach the rest of this border. It's getting soooo close! This border has been quite a marathon - with HUNDREDS of pieces, but I think it has been really worth it. I took a peek at the next two borders, and they're much simpler. I'm really looking forward to working on them.